Amtul’s Public School provides a classroom environment that fosters excellence and motivates students towards better performance. Our classrooms are aesthetically designed and integrated with 5 smart boards and well furnished desks and chairs. They are well ventilated, lighted, aesthetically designed and spacious. Our labs are comfortable, spacious, well-equipped and airy. Special care is taken about the safety of the children. The stock and condition of apparatus are checked & updated from time to time. To motivate students, to learn through practice, we have provided our students with a fully-equipped mathematics lab. Students in addition to regular work, also play mathematical games like puzzles in the lab area. We provide an opportunity to students to understand and internalize the basic mathematical concepts through concrete objects and situations. We enable the students to verify or discover several geometrical properties and facts using models or by paper cutting and folding techniques. The school has a fully equipped and regularly updated computer lab to help the children keep abreast of the tech-savy world. All students are encouraged to use the computers extensively for their project work and assignments. We have social science lab which is well maintained and equipped with many political and physical maps of India and the world. Many charts models, globes are displayed. The boarders are taken care of by well trained and caring wardens. A very homely and friendly atmosphere exists in the hostel. They feel very much a part of one family, which plays together, eats together and laughs together. Special nursing care is provided. The doctor visits the school campus once a week and is available on all days, in case of an emergency. The food provided in the dining hall is wholesome and nourishing. The daily diet consists of milk and milk products, cereals, vegetables, poultry, meat and seasonal fruit. A staff member is on duty to ensure that children eat their fill. Special attention is given to the eating habits of the children and their table manners. The Children take their meals in a common Dining Room. The dining room is departmentally managed by the school. The food is hygienic, nutritious and ample in quantity. Three meals are served in addition to afternoon tea and snacks. A variety of veg and non-veg food is available according to the choice of parents. Amtul’s is housed in a heritage building. The dormitories are spacious and comfortable. Besides cozy beds, each child is provided with a wardrobe for clothes and other personal belongings. The common room, reading room and gymnasium are well equipped. Facilities for T.V. and dish antenna are provided for educational purposes. The school also ensures that all resident students are in the best of health. To do so regular medical and dental check-ups are conducted and there is a doctor on call 24×7 to take care of any emergency. The school also employs full-time nurses and maintains an infirmary equipped with modern medical equipments. All in all, Amtul’s is the destination for parents wanting to give their wards the best in holistic education available in India today. With emphasis on over all development of mind and body, Amtul’s provides ample activities in all fields. Students are trained in Hockey, Cricket, Golf, Basketball, Football and Table Tennis. The school has a well equipped gymnasium, a skating rink and Billiards room. Being situated in the hills, students also learn mountaineering. Besides sports, students take part in debates, plays and other co-curricular activities. The school has a common room for indoor games like chess and carrom. Students are also trained in Fine Arts and Dramatics. 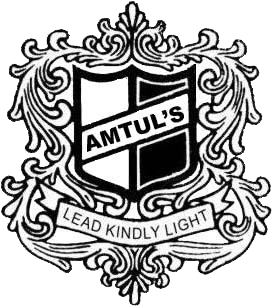 Nestled in the sylvan ambiance of the Kumaon hills, Amtul’s Public School is a co-educational residential school from class I to XII. © Copyrights 2019 Amtul All rights reserved.